Nokia Email application and service available since August finally has been updated, after first stage of public usage and testing. New version offers using up to 6 e-mail accounts, supports new languages, deleting messages on server side directly from your phone. Application can be installed now on N96 and N78 devices as well. Of course I will start testing it and I intend to share my comments and impressions with you, but I encourage you to do the same as well, especially if you are E71 user. I have defined two different signatures for those two accounts, but when I start creating a new message it uses only one of them and switching between accounts doesn’t change the signature. I have defined “From” fields, so the person receiving a mail from me could see for example “Dexter”. Unfortunately application sends just e-mail address in this field. I have checked it on my account web page and so far I haven’t found any solution. As good beta user I have already posted those bugs to Nokia Email feedback. If you have found anything else please do the same and share it in here as well. Nokia Communication Center 2.0 available! Today Nokia Beta Labs announced that a new version of Nokia Communication Center, marked as 2.0 is available for public beta tests. This piece of software was previously integrated into current version of Nokia PC Suite. 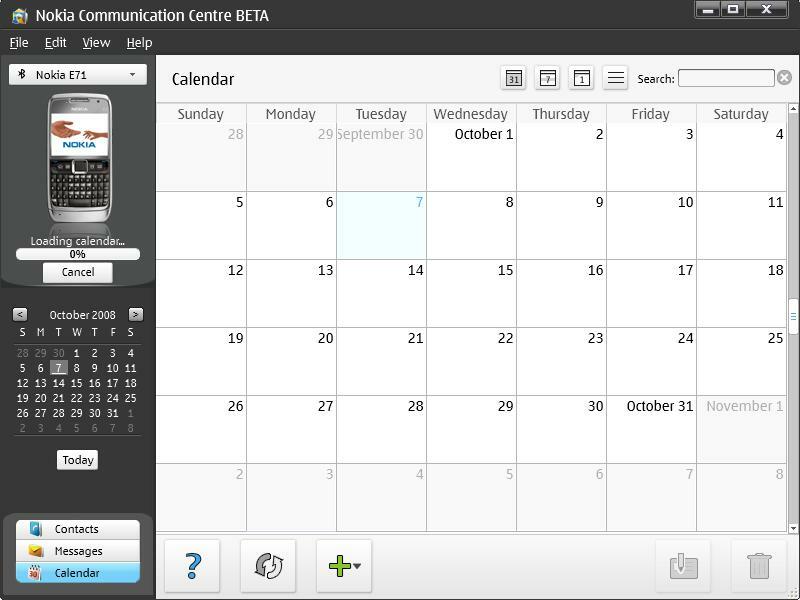 The new version contains many bug fixes and suggested features added, for example: calendar editor, contact group support, contact thumbnail view and performance improvements. New NCC is of course compatible with Nokia E71, but you need to have installed on your computer Nokia PC Suite 7.0.8 or higher. Remember that Nokia Beta Labs team always welcomes all users bug reports or suggestions! Check the application description and download it from here. Nokia Beta Labs presented today a new Java-based enhanced calculator application for Nokia S60 devices. The application can be known to S40-based devices’ users and now is available for S60 as well. It offers simple arithmetic calculator, plus scientific and loan features. “not fully tested, but should work on all Nokia S60 based devices with QVGA display: E50, E51, E61, E61i, E62, E65, E66, E71, N71, N73, N75, N76, N77, N78, N81, N81 8GB, N82, N92, N93, N93i, N95, N95 8GB, N96, 5320 XpressMusic, 5700 XpressMusic, 6110 Navigator, 6120 classic, 6121 classic, 6124 classic, 6210 Navigator, 6220 classic, 6290, 6650”. 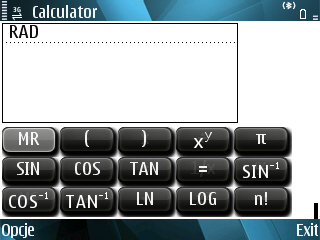 Unfortunately in comparison to cCalc Pro which uses full E71’ QWERTY keyboard Nokia’ application seems to be poor. A few last versions of Nokia Sports Tracker for S60 devices (including Nokia E71) are facing problem with application’s freeze, after a few minutes, or kilometers of active tracking. The problem is present no matter, if you are using internal GPS module, or external one, connected via Bluetooth. It seems that Beta Labs team is familiar with this problem, because a lot of users posted and mailed them with bug reports, but still there is no official fix for this issue. Thankfully on Nokia Discussions Board user ggm02 published a workaround for this issue. How to make it working? 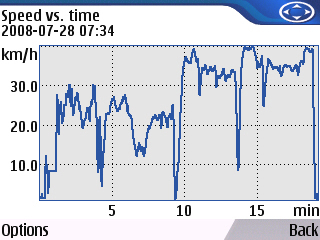 Start Sports Tracker as usual, after it connects to the satellites and starts tracking use navi-key (for example press it twice up) to see a diagram screen. Now you can hide application in a background and it should work fine. The problem with freezing seems to be present only when you keep application working on a main screens where speed and distance are constantly displayed.